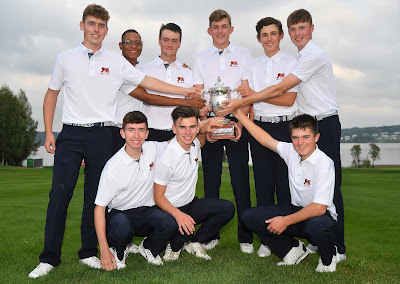 Great Britain and Ireland have won the Jacques Léglise Trophy boys international tournament by beating over the Continent of Europe in Finland over the past two days. The visitors headed into the second day with a three-point advantage and increased that to six pt with a 15.5-9.4 victory margin. After the morning foursomes session was halved 2-2, the GB and I side required just 3.5 points in the afternoon to claim the trophy. Early wins from Max Hopkins and Connor Gough, coupled with Barclay Brown's half-point versus Adam Wallin, which was helped by a 30-metre chip-in for birdie on the 16th hole, meant GB and I required just one more point. Robin Williams secured the deciding point on the 17th hole, meaning GB and I would lift the trophy for the first time since 2015. Australia-based Connor McKinney, the only Scot in the GB and I team, halved his second-day foursome but lost his singles tie by two holes.